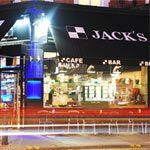 Jacks is a trendy British-American diner, serving all-day and all-night breakfasts, gourmet burgers, prime Angus steaks and a large range of salads. It also does a great range of sandwiches and paninis during the day, plus the thick American milkshakes, onion rings and mozzarella sticks. Do you work at Jacks? 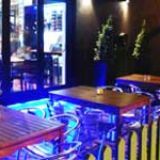 Large patio with wind proof screens, heaters and picnic style benches. What did you think of Jacks? Fantstic food here! I am always left content and full. A must if you are in the area. Terrible... she, the waitress in jack's the pregnant girl ,don't know about wine! gave to us a glass of the oxidazed one, and make us paid the half of that! Ridiculous...will never recomend again that place and will never come back! Went there last Saturday with friends. It is a Queens Park cafe that is typical of that area; high on price, low on quality. I had a £7.00 3 egg spinach 'omelette' that came flat, round and burnt with absolutely no flavour. Accompanying that disaster was a small portion of pre frozen chips. The bacon sandwiches were 2 meagre slices of back bacon in doorstep slices with a small handful of potato crisps. To compare themselves to an American style breakfast place is laughable as the simplest of benchmarks for decent cooking is the ability to make a simple omelette. This joke of a place failed miserably. Be very careful. We took my son there on his 15th birthday. The food was ok, service was apathetic and slow. My son found broken glass in plate of salmon and scrambled egg. Luckily he hadn't ate any of the glass, or we'd have been on our way to A&E. When I told the waitress, she was totally uninterested! She hardly replied, just took the plate away, as if we were a great nuisance to her. My son didn't want a fuss, so I had to just grin and bear it, then pay the bill. 2 years ago, but it still upsets me. He could have been really hurt. Our family refer to this place as 'The Broken Glass Cafe.' Dangerous place. The surroundings are nice and the food is okay and the pricing is reasonable, so it's often busy. I go there reasonably often as its local. I really want to like it more, but what let's Jack's down terribly is the poor attitude of the staff. Normally they are just bored and indifferent, too often however they are bordering on the chilly. Often they aren't very good waiters either - Jack's does not seem to bother training anyone, and it shows. Eat here if you don't mind feeling like just another mug punter. Nice location in Queen's park but disappointing place. Been to Jacks a few times for same reasons as other reviewers - lack of other breakfast places in the vicinity. The food is ok and fairly reasonably priced but definitely nothing to write home about. The service is always terrible. The waitresses just hang around, repeatedly get orders wrong and look surprised when you ask for anything. Shame as could have potential but needs different management, staff and warmer decor. I went to a restaurant on Portobello road and was blown away by their eggs benedict, service and warmth, not telling where as the place is a gem! Jacks need to look at how other successful businesses operate. Pretty much the exact opposite of what they're doing now! Food reasonably priced, but of very average to poor quality. Service is almost non-existent (took 50 minutes to receive a very poor breakfast, with waitstaff complaining of being busy - despite lounging by the wall for about 30 minutes)... but what left me the most baffled (and determined never to return) was some genius' decision to install flashing strobe lights at various parts of the rear seating area, pulsing about 100 times per minute. Fine for a nightclub, but for a cafe? During the day? I have been dwelling on this for hours on end, but I can't think of a single way that a cafe could be improved by the addition of pulsing strobe lights. Who on earth thought it was a good idea? Puzzled as I was, I asked one of the (completely uninterested) waitresses what the point of the lights was. Naturally she had no logical reply. I asked her if they had ever considered people who get migraines or epileptic seizures which are triggered by that very thing - she laughed at me, like i was making a hilarious joke. Avoid like the plague. The sooner this place either goes out of business, or finds new management (with half a clue), the better. Being my local cafe / diner i have given it more than enough opportunities to redeem itself from far to many bad previous experiences there, however my last meal was a the final straw. We were seated then ignored for 40 minutes until we finally managed to get hold of a waitress so we could order our food. Her knowledge of the menu was very poor and involved us having to point at things on the menu so that we could order. Then the food came, and the waitress only brought out 2 knife and forks for the 3 of us and one of the dishes was the wrong thing. Waitress disappears again... Then i realised in my chicken dish there was a fried / cooked Daddy long legs spider that had obviously been there during the chicken being cooked. I then asked to speak to the manager, he was very rude and told me its not a daddy long legs its a mosquito! to which i asked what does it matter either of them shouldn't be in my food and he replied with "Well I'm just correcting you! It was a daddy long legs especially given the length of its legs! LOL Its appalling anyone in the food industry can have this attitude! He didnt even apologise. Every meal i have ever had there has been poor quality food and awfully rude service. Stay away! For a better breakfast and a great service try Hugo's, just down the road from Jacks! Would NEVER go back here and would DEFINITELY never recommend this terrible place. Expensive double espresso tasted like burnt filter coffee, the hot milk we asked for on the side was warmed in a microwave it seemed, not frothed or steamed (the place seems to love its microwave). The coffee was disgusting and poorly made to say the least. For a hip area you would expect much more of a 'cafe'. Both of us ordered the eggs royale (the one with the salmon) and a side of hot chips. Upon putting down my boyfriend's meal, the waitress sat the dish on his coffee and spilled coffee over him and our newspaper. No apology or offer for another coffee. The hollandaise looked canned, it was fluorescent yellow and tasted synthetic, otherwise the dish looked promising. We seasoned and sauced our dishes and tucked in. It was all mildly luke warm, and the hash browns were chewy and cold. Naturally we complained and asked for fresh dishes, not ones that had been sitting on the pass for a while (as it appeared these had). They said sure and took our dishes away. They returned promptly with exactly the same dishes, MICROWAVED. SALMON - MICROWAVED. Ketchup now with a nice film on it from the microwave and smoked salmon decidedly chewy. We walked out. So disgusted with this place. Needs a take over, management and kitchen clearly have no clue.Do not waste your money, time or energy on this place!We went up the road to The Alice House and they completely redeemed Queen's park for us. Great service, lovely fresh food and NO MICROWAVE!!! DOWN WITH JACKS! Went to Jacks for my nephew's birthday on Friday evening & was totally unimpressed. They were out of 3 main dishes on the menu, steak, salmon & sea bream, this left us with a choice of either beef or chicken burgers! You would expect the full menu to be available at 8.00pm on a Friday. The service was extremely slow & rather impolite. I definitely won't be going there again! I visited Jacks a couple of days ago with a friend and had food from the lunchtime menu. For the price it was OK. Service was not brilliant, I think the waitress was having a bad day - not a smile or a please or thank you. I visited Jacks today with my partner I thought I would try out the american breakfast dishes. We have both been to America several times and this breakfast was far removed from american style food. Firstly, we were asked if you would be willing to share a table, although there were many tables vacant - we said we were not willing, they reluctantly sat us at a table. We ordered the Yankee breakfast, which included, pancakes or french toast, two crispy slices of bacon, two eggs to order and maple syrup. The 'crispy' bacon was cold and soggy, the extra mushrooms we asked for seemed to be out of a tin, they were grey, soggy, cold and mushy. In fact the whole breakfast was warm at best. When I asked the waitress for sugar for my coffee, she seemed shocked that there was no sugar on our table and proceeded to argue with another waitress, regarding this issue, right next to where we were sitting. We were not offered any refills of tea or coffee. Staff seemed more keen to argue with each other than serve customers. When we went to pay, the guy at the till asked if everything was OK and we told him no - he seemed quite shocked. He did not charge us for the mushrooms and apologised. We do eat out a lot and and rarely complain of anything, but we thought on this occasion criticism was merited. The restaurant itself is nicely laid out and in a good location, it's a shame the service and food let it down. I've been to Jack's for breakfast about 5 times now - due to a lack of other brunch places in the immediate area I have given it more chances to redeem itself than I otherwise would have. First the good, the food is reasonably priced. A decent range of items on the menu and all at good prices. The food is adequate: not especially memorable or tasty, but I left full. However, the service has been absolutely appalling each time I've eaten at Jack's. On every occasion, a member of my party has ordered one of the set breakfasts including cereal, toast, juice and fruit salad. Not once have all of these items arrived. The wait staff routinely bring just the cereal and have to be chased for each other part of the meal. The same applies for drinks, which tend to be neglected completely or, at best, arrive while you're completing your meal. Also, every time we've had to ask for cutlery after having our food plunked down on the table and the waiter disappearing. A notable point had to be when my dining partner asked for milk for his bowl of dry muesli (as the yogurt was served mixed with fruit salad which arrived about 20 minutes early and had been eaten) and the waitress's exclamation of horror caused the surrounding tables to stop eating and stare at her. The result was that we were given a milk jug from another table's tea service, amounting to several tablespoons of milk. Our bill included a charge for the 'extra' milk. One would have thought milk would be included in the price of cereal, but evidently not. I don't expect to be pampered and waited on hand and foot for the prices they charge, but there is a general level of incompetence and carelessness that makes Jack's an unpleasant experience. Coupled with the consistent rudeness from staff, I've found this a highly disappointing experience that, based of several meals, I can only assume is the usual standard at Jack's. 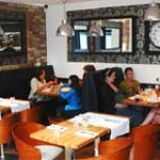 Came across this restuarant by chance, food was very good the two courses for £10.95 was good value, service was attentive without being obtrusive and the ambience of the restaurant was relaxed and informal. The only downside was that a couple of the choices from the menu weren't available hence the four stars. Queen’s Park is on the up: a decade ago, it was decidedly rundown, then young professionals started to colonise and now you can barely move for top-of-the-range baby buggies and 4x4s. How wise of Jack Gokce in 2004, therefore, to transform a sad greasy spoon on one of its main thoroughfares into a civilised, modern, value-for-money cafe. Now he has gone further, opening for evening meals, too, seven nights a week. Nowhere is the contrast between old and new Queen’s Park starker than on Salusbury Road where tired convenience stores and fried chicken outlets collide with chic clothing emporia and top-end delis. 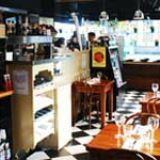 Jack’s very clearly belongs to the new: its bentwood chairs; solid, no-nonsense oak tables; black and white chequerboard tiled floor and beige tongue-and-groove walls nod toward the classic French bistro. The myriad tiny fairy lights in the front window are a delightful eccentricity. There is seating for about 28, plus an area at the front where lunchtime takeaway sandwich and soup customers can queue. The cafe’s daytime clientele comprises office staff plus the middle-class mummies who are taking over the area with offspring in tow. If you aren’t over keen on the merry burbling or despairing wails of toddlers, come at night when those front fairy lights twinkle, other lights are dimmed, candles are lit and Michael Buble croons. Service is well paced and the waiting staff are charming and competent. All-day breakfasts include bowls of muesli (with a free refill if you can manage it), fruit salad, and yoghurt and honey for the Healthy; American pancakes or French toast with maple syrup for the Modern; and fry-ups for the Traditionalists, rising to the heart-stopping (let us hope not literally) ‘Triple’ of three bacon rashers, three sausages, three eggs, tomato, mushrooms, beans, three slices of toast plus chips or hash browns for a reasonable £7.65 (£1 more in the evening). Breads for the sandwiches include baguette, granary bap, crusty doorstopper and ciabatta. Fill with classics like prawn mayonnaise or Cheddar and Branston, or go trendy with mozzarella, roasted vegetables and sun-dried tomatoes. Many varieties cost under £3. There are numerous filled baked potato options, a soup of the day, salads and hot mains from midday. 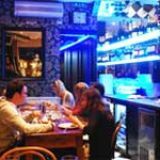 The salads and breakfast fry-ups survive into the evenings when the burger menu is seriously and intriguingly augmented (Kobe beef, wild boar, kangaroo or venison versions, anyone? Yours for £8.95 - £10.75). There’s steak with chips and Portobello mushrooms (sirloin, rib-eye or rump), or how about a hot dog with fried onions and fries? The vegetarian burger (£7), featuring charred red pepper, Portobello mushroom, goat’s cheese and aubergine is a surprise. Rather than chop or mince the ingredients to form a burger, chef has simply cooked them to perfection and stacked them up, on a bed of fried onions, in a sesame bun. With gorgeous melting cheese and clear Mediterranean flavours, it’s hard to believe this is a healthy option. It comes with fries or, for the super-healthy, chopped salad, a zingy bowl of tomato, cucumber and spring onion lifted by masses of fresh-as-a-daisy parsley. From the eight salads, Jack’s meaty salad (£6.10 by day, £1 extra at night) is another ultra-simple success, thanks to quality ingredients. Leaves, tomato and cucumber are topped with juicy chicken pieces and impeccably crisp, salty bacon. There’s a little pot of French dressing to add yourself. Potato skins (£3.40) are crisp with plenty of squidgy potato inside and arrive with a yummy dipping choice of sour cream and garlic mayonnaise. Top marks, once again. Evening diners will surely expect to be able to choose a full meal but puddings are a real let down, with a modest selection including apple crumble pudding (£2.75, custard 65p extra) and Haagen-Dazs ice cream (one scoop £1.45, two £1.95, three £2.45). There’s no sign of crumble, alas, in the former. Its cinnamon flavour and sultanas are enjoyable, but the dough is soft and stodgy as it sits in a sea of okay custard. And, despite the fact that Haagen Dazs produce countless, unusual flavours, all of which could be offered just by keeping a tub of each in the freezer, the selection is that unholy old trinity of chocolate, strawberry and vanilla (staff blame lack of freezer space). Regular tea and filter coffee come in bottomless pots. Under the delightful heading ‘Posh Teas’, you’ll find Darjeeling, decaffeinated or regular Earl Grey, peppermint, green, redbush and many more. All the usual coffee suspects are there plus hot chocolate. Fizzy drinks, juices, waters, smoothies and thick American shakes complete a comprehensive non-alcoholic list, all at reasonable prices. Five white wines, five reds and two beers are also on offer, the list appearing as the label of an empty wine bottle on each table, a nice touch. Both whites and reds range from £12.95 to £22 and, commendably, more than half are available by the 250ml glass. At £4.75/£12.95, Spitting Spider 2006, Mclaren Vale, Australia is a delightfully zesty, fruity Riesling/Chenin Blanc/Colombard bargain. It arrives correctly chilled and stays that way thanks to its wine cooler. A jug of tap water is provided without demur. Jack’s has been a great success: locals love the big breakfasts, morning coffees, hearty lunches and afternoon teas, and should find night-time dining equally to their taste, especially when it’s quite possible to enjoy a main course, side dish, dessert and half a bottle of very palatable wine for £20 including service (commendably, a 10% gratuity is suggested but not included). Desserts need to be taken more seriously but, otherwise, the simple dishes are executed near-faultlessly at this professional, friendly establishment, a continuing boon to its up-and-coming surroundings.